The small faint constellation Cancer is rich in open clusters and double stars. Cancer is the faintest of the zodiac constellations, and unfortunately shares its name with a devastating disease. It is the only constellation containing a deep sky object, the Beehive Cluster, which is brighter than all but one of the stars in the constellation. Cancer is the Latin for "crab." Its association with disease came long after its association with astronomy. It was sometimes known as "the dark constellation" because of its lack of bright stars. Its brightest star, Al Tarf, is magnitude 3.5, far fainter than the famous open star cluster, known as Praesepe or the Beehive, which is magnitude 3.7 (on this astronomers' scale, lower numbers represent brighter objects). Ancient astronomers were fascinated by Praesepe's cloud-like appearance. One interpretation was that it was a manger at which two donkeys fed. These were two stars named Asellus Borealis and Asellus Australis, the northern and southern donkeys. When Galileo turned his telescope on Praesepe, he discovered that it was made up of dozens of stars. Its resemblance to a swarm of bees led to its alternate name, the Beehive. This star cluster is a magnificent sight in binoculars and even through the smallest telescopes. It is a bit difficult to find because there are no bright stars nearby. Look about halfway between Castor and Pollux in Gemini, and Regulus in Leo, and you should spot it. In 1769, Charles Messier added it to his catalog of comet-like objects, giving it the number 44. While exploring this part of the sky a few years later, Messier discovered a second open cluster, to which he gave the number 67. 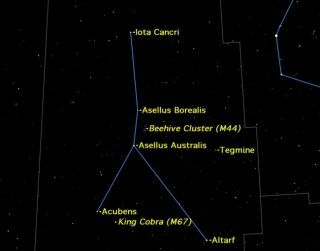 This is sometimes known as the "King Cobra" Cluster. Cancer contains a number of beautiful double stars worth exploring with a small telescope. The two stars which make up Iota Cancri are separated by 30 arc seconds, wide enough to be split in some binoculars. A telescope is needed to split Zeta Cancri, also known as Tegmine. It consists of two 6th magnitude stars 5.1 arc seconds apart. Larger telescopes have revealed two more components, making this a quadruple star. The constellation Cancer also contains a star, 55 Cancri, known to have a system of planets, four gas giants and a fifth smaller terrestrial planet which may have liquid water. This star is 40 light-years from the sun.